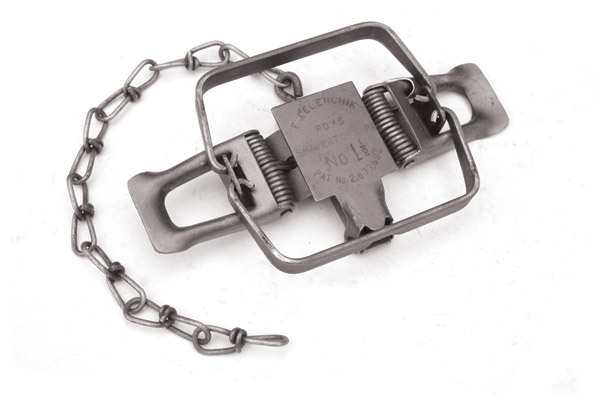 Frank Elenchik, Shavertown, Pennsylvania, began making his own traps in the 1950s because he was not satisfied with the traps on the market. Others liked them so much they asked him to make traps for them, as well. Elenchik asked a friend, who owned a machine shop, to make trap dies, but the friend was too busy, so he let Elenchik use the shop to make the dies himself. Elenchik also made the tools necessary to assemble the traps, all of which were made and assembled in the basement of his home. March 17, 1959, Elenchik was awarded patent No. 2,877,596 for a trap with jaw ends that protruded outward. However, almost all of the traps he built had jaw ends hooking inward on the base. Elenchik traps included several innovative features, such as a wide base, spiral wound springs (two under each lever with one end going up inside the lever while the other end hooked into a hole in the base), low pan placement, and a swiveled D-ring centered under the base. The majority of Elenchik traps were No. 1-1/2 and No. 2 with a very limited number of No. 4. Some bore no stamp, but most pans were neatly stamped F. J. Elenchik RD # 5 Shavertown, PA No. 1 1/2 Pat. No. 2,877,596. There were at least six pan variations from round to square, as well as different dog setups. Some of his earliest dogless traps have a piece of metal protruding through one jaw, but he soon changed to a crimp or “dimple” in the jaw, because the earlier ones didn’t hold up. He made No. 1-1/2, No. 2, and even No. 4 traps with a pivot mount “drop dog” setup. Elenchik felt this arrangement would prevent the chain tangling around the dog post. He made a few traps with round spring steel wire levers but found them too hard to set. He also made No. 1-1/2 traps with double jaws, by simply cutting the center of the jaw material and pressing that portion down (much like the Diamond Brand). He also made a limited selection of No. 2 traps with off-set jaws. Elenchik figured he made 2,500 to 4,000 traps in all. Because the traps were all handmade, there are not many exactly alike. I have 43 different versions of Elenchik traps. I understand Elenchik passed away two years ago, at the age of 94. As for collector value, the traps average about $25 each, but I have seen unusual models go for as much as a couple of hundred dollars. I want to thank North American Trap Collector Association member Buck Hutchinson, of Forksville, Pennsylvania, for his assistance with this month’s column.